All these flavours are very gentle and understated except for the lime, which adds a final kick and brings everything together. Quarter the melon, scoop out the seeds and cut off the peel. Slice the melon into thin wedges and cut each in half. Peel the cucumber and then cut it in half lengthways. Use a teaspoon to scrape out the cucumber's seeds, then cut the flesh into slices. Put the melon and cucumber in a bowl. Pluck the dill fronds from the stalks. Add the fronds to the melon and cucumber. If the prawns are very large, cut them in half lengthways. If necessary, remove the black vein running down the back. 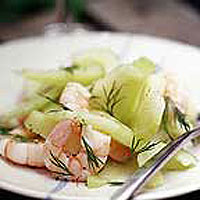 Add the prawns to the bowl with the melon. Season, add the lime juice and toss well. Serve chilled as a starter or double the quantity to serve as a main course. This recipe was first published in July 2004.